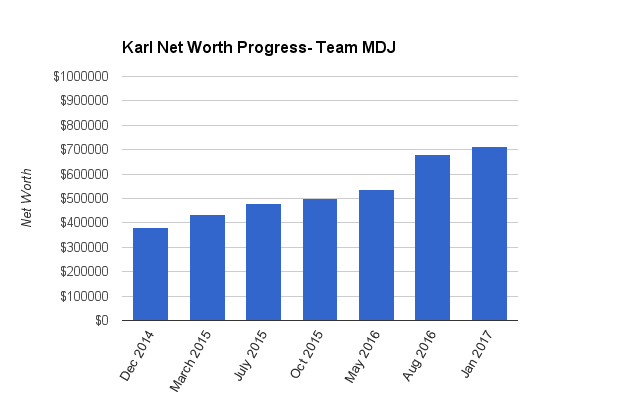 Welcome to the Million Dollar Journey January 2017 Net Worth Update – Team MDJ edition. A select group of readers were selected to be part of Team MDJ which was conceived after my million dollar net worth milestone was achieved in June 2014. Karl the Real Estate Agent was selected as a team member and will post net worth updates on a regular basis. Here is more about Karl. Family Income: $150,000 (Personal full-time job); $TBD (Income from consulting company); and, $100,000 (spouse full time job). Goals: Mortgage paid off by 36 (done! ), million dollar net worth by 40. Notes: Almost all of net worth is in the real estate market (principal residence). Starting to invest in the markets now. Even more changes in the last 6 months. I have parted ways with some of my savings to purchase a stake in a consulting firm. The idea has been on my mind for a while so I took everyone’s advice and ditched the Porsche (with a slight loss) and took that money to buy in. So far in just 2 months it has proved money well spent and is going to allow me to increase my annual earnings substantially. I’m on track to re-coup my investment inside of the first 4 months and forge ahead from there. I decided to do this as a way to help protect myself and my income from the looming correction in the real estate market. I was also drawn to the benefits of being able to operate as a corporation. So I have seen a dip since the last update but I am still in a now in a good position to make the most from 2017 and massively to my net worth through investments. originally planned which netted my corporation a hefty profit. Furthermore, I have also taken on holding a second mortgage which pays 12%/year for a one year term as well as setup and discharge costs. This investment is secured against the property. Goals for 2017 – With a rise in my wife’s earnings due her crazy work ethic as well as with having our home paid off I’m super excited for what the year should bring. We are currently able to live off my wife’s wages completely and as such we are hoping to save as much of my wages as possible. We have some projects around the house that we have put off while we pushed to get the house paid for and they now need addressing. That being said nothing will be paid with credit. In regards to investments 2017 looks as follows. RRSP- Waiting to see how the taxes look this year but I will be finally contributing again. That really is my focus this year. Finish up around the house and save like crazy. I welcome everyone’s comments and feedback. investing is done outside our principle residence. I currently own one rental semi-detached 3 bedroom in my personal name. Wow, lots of action for you, sounds like you are set to make lots of net worth progress. If you are in a higher tax bracket it would be more tax efficient to live off your wages and save and invest your wife’s wages. Well, you’ve certainly made good progress. Your balance sheet looks much cleaner and the changes you’ve made are all positive. The second mortgage is risky as in a downturn, it doesn’t matter if it’s charged against the title if the first place mortgage takes up all the equity. But it’s only for a year, so you should be able to get out at the end without a loss. Interested in what type of consulting you are doing. With the changes you’ve made, you should be able to sock away 80K a year in to the RRSPs and TFSAs to bring them up to where you should be. Do that for 2-3 years and then you’ll be in a position to dabble again in real estate as any correction would have started by then, and it’s almost impossible for someone who made their money in real estate to quit it cold turkey forever. Thank you for the encouraging words. The 2nd mortgage is only 70% loan to value and a one year term so I”m not to worried about it. Prices have risen another 10% since I took it on so I should be covered. Sounds like you are making some better choices. You seem to like taking some big risks which is OK if you are willing or able to lose. I also did an investment on a second mortgage years ago thinking it was a no brainer (also 12% annual paid monthly). When time came to repay initial investment things started looking shady. I was eventually repaid in 6 months including interest but a short time after that other similar investments they had started to fail. My father in law lost $500K and many others lost as well. Lesson to learn is if it sounds to good to be true it generally is. I can almost guarantee that the appraisal on the property you have is overvalued. I’ve included a link to the company in question with one of the lawsuits that proceeded. This was not the property my father in law invested in, he chose not to go to court because his lawyer said they would win but the company had nothing so winning nothing would cost him in legal fees. Also check this article out. Be safe out there. Very well done Karl. If you’re able to stay out of debt, live off your wife’s income, and then bank/invest everything else – you’ll be set for life within another 10 years. Well done Karl, you’re on the good way to get 1m of net worth. It looks like you are doing very well, and I think it’s smart that you are trying to diversify out of real estate, as a huge correction is indeed coming. Good post. Are you investing in index funds across global markets to protect against local downturns? Diversification is key for long term consistency and risk reduction. Plan is to invest in Blue Chip Canadian Dividend paying companies to take advantage of DRIP and tax advantages. Even from what I own now I’m more of the passive investor and with time on my side my #1 concern right now is getting my money into the markets asap. After doing some online research I have decided I’m going to be going the Vanguard route. My ability to earn money is much better then my ability to try and get an extra 1-2% on my stock account so I have decided to just focus on being frugal and getting the money working in my Vanguard Dividend Fund. It’s great to know another fellow realtor blogger (I am also a realtor). Good thing that you are settling down on your principle residence as the CRA may make you pay capital gain tax if you buy and sell too often. It’s all in the opinion of the CRA when they audit you. This is so inspiring. Thank you so much. I was exploring the topic on how to not waste all that money on a wedding. I definately agree it is better to invest it or do something more productive. I’m glad you find it inspiring. All the credit goes to the frugal trader. Without my accountability to this blog I can honestly say I would be no where as close to my goals. I’m not perfect and still waste alot of money but this keeps me from staying off track for too long. I’m excited for what 2017 can bring me. Amazing job. If you’re able to stay out of debt, live off your other income, and then bank/invest everything else –it is incredible. Thanks for keeping us up to date on your progress. I always like to see where other like-minded individuals are at with their progress towards their goals. You sound quite confident in you post that there is going to be a real estate correction. What are your reasons for having such a strong opinion about this? Also, what city are you in? Thanks. My feelings and predictions on the real estate market are solely mine and I have as much hope of being right as the next guy. That being said I was in the industry during our last quick correction in 2008 and after seeing and living through a quick 6 months of real estate turmoil I need to protect my lifestyle against it. My biggest reasoning though for seeing a correction is being east of Toronto we have seen a huge influx of foreign money into our market which has pushed prices through the roof and at the same time increased the amount of single family rental homes 10x in the last 2 years. Taxes are $7000 a year. Karl what type of consulting firm did you get a job with? It looks like a decent source of secondary income! Al I would love to expand on my consulting gig but unfortunately it would be too easy for my identify to be sourced.